Derrel Watkins (editor), Haworth Pastoral Press, Binghamton, New York, 2003, 225 pages, ISBN 0789022273, £26.94. The Christian religion is a universal phenomenon. However, the theories and practices that surround Christianity are hugely diverse, shaped by context, culture and experience. So it is interesting to note that while the Christian religion continues to experience significant decline in Europe, it is still a significant force in both North and South America, as indeed in Africa. This edited collection of essays reflects the vibrancy and energy of church life in North America and its commitment to exploring what theologies might best help us to understand the nature of the ageing process and to respond pastorally to older people. The volume strengthens the Haworth Pastoral Presss innovative series of books in this field. This commitment to older people stands in sharp contrast to the present situation in British church life, where older people are largely marginalised or taken for granted. There are fourteen essays, written by educators and practitioners in the field of practical theology. This field covers many specialisations in the USA, such as specific disciplines of pastoral care, pastoral psychology and counselling, and the churchs ministry and outreach to particular groups like older people. It is important to note that the lines between these ministries are often blurred and that there is no coherent theoretical foundation that supports the study of the field as a whole. Indeed these practical disciplines depend more upon information derived from non-theological sources than from theology. Watkins hopes to redress this omission by providing essays which are theologically based, and from this base offer guidelines for practice. The first two chapters honour a pioneer in the field of gerontology (Barbara Stancil) who worked hard to encourage churches to honour the place of older people within congregations and especially in the understanding of the expression of sexuality and intimacy for older people. Chapters three, four and five offer some of the basic theological concepts out of which a practical theology might be more thoroughly developed. These chapters look at some of the ultimate questions that older people ask about the meaning and purpose of their lives, especially in relation to pain and suffering. 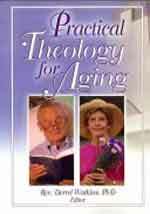 There is a chapter on the biblical foundations for a practical theology of ageing, with particular emphasis on Alzheimers disease. One of the writers develops a conceptual framework for including persons not generally considered in need of spiritual care. There are chapters on rehabilitation, healing and wholeness; education; preaching and worship. Questions of spiritual formation, human identity, creativity and fulfilment are also explored in the latter part of the book. The final chapter addresses the reality that the older generation can be easily overlooked by church and community planners and offers a persuasive set of arguments for the inclusion of older people as a source of value and wisdom. Watkins is to be commended for drawing together a stimulating collection of essays which were all thought-provoking and helpful in relation to both theory and practice. The writing is (perhaps inevitably?) uneven and the editor might have exercised some measure of influence over some of the expression of thought, and over repetition and inter-relationships between the essays. The volume lacks a comprehensive bibliography and certainly would have benefited from an index. Finally, in terms of how these essays might be used, some pointers for further thought and reflection at the end of each of the chapters would have been helpful for students and practitioners alike. A note of caution is worth articulating at this point. It might have been useful in this theological text to be honest about the ways in which religion might be destructive to human well-being. What are the legitimate objections to belief as it shapes an individuals self-image and sense of destiny, especially in old age? Is religion enabling of a fundamental and healthy self-love? Does religion help older people cope with diminishment, change and death? While there is plenty of research to suggest that religion can have a positive contributing influence on well-being it might have been useful for further research to reflect upon a distinction between good religion and bad religion. Might we learn from older people themselves and their experiences of community, faith and pilgrimage, as we gain a greater sense of the limitations and possibilities of religion? However, the success of the writing in this book lies in its ability to stimulate the reader into further thought and action. For those of us who work in the field of the care of older people, these essays encourage us to consider our understanding of the spiritual and religious dimensions of ageing as key areas for growth and wholeness. Indeed, it may be that these non-physical dimensions of ageing have much more significance than other aspects which are often given more consideration. Those working with particular theological questions and insights could profitably co-operate with others in a re-visioning of ageing that tackles such fundamental questions as: the significance of life; the valuing of dependence; the nature of time and ones life story; the place of change and loss; the condition of temporality; the acceptance of mortality; and the high value we place upon work and activity for our identity. Is it possible to harvest authentic, shared spiritual experience which enables those engaged in the process of ageing to articulate its questions and impossibilities in a way which is liberating and informative for care? Those wary of religion might look at some of this material to see how it tackles some of this theological work. Despite its decline in Europe there seems to be little doubt that theology has a legitimate place in both our understanding of the nature of ageing and our practical responses to it.